This is a Korean-style rice dish. 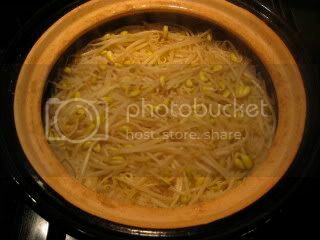 it's called Kongnamul Bab. You cook the rice with the soy beans and other ingredients, and eat the rice mixture with a drizzle of soy-based sauce over the rice. I think the more popular versions are mixed with meat, but I like it lighter, so made only with vegetables. I think the authentic Korean version uses hot chili peppers in the sauce, but my version doesn't have the heat and it's mild. The rice turns so shiny and it's really tasty. I almost finished the full 2 cups of rice myself! I posted the recipe on toiro's website.